Points Nécessaires : 8800 Software is not compatible with mobile and tablet devices. Please add this title to your Wish List and sign on to your the first club account from a desktop computer to complete your redemption. NOTICE: The base game The Elder Scrolls Online: Tamriel Unlimited, a persistent internet connection and an Elder Scrolls® Online account are required to play. Upgrade Edition	Upgrade Edition: Existing players can upgrade their current game to unlock the new The Elder Scrolls Online: Summerset content. About the gameThe Elder Scrolls Online: Summerset is the next Chapter … of ZeniMax Online Studios’ award-winning online RPG, The Elder Scrolls Online (ESO). This new adventure in the ESO saga will send adventurers and their friends to the Summerset Isle, to visit and explore the ancestral home of the high elves for the first time since 1994’s The Elder Scrolls: Arena. Players will also be able to explore the island of Artaeum, home to the mysterious Psijic Order, a group of sages that predate the Mages Guild. Tamriel’s fate hangs in the balance and the heroes of ESO are called upon to save the world once more. This year’s Chapter introduces an enormous and stunning new zone unlike any other, a fresh skill line with new magical powers to master, an expanded crafting system to forge powerful gear, and the continuation of the epic and award-winning ESO story. With more than 30 hours of new story content to experience, The Elder Scrolls Online: Summerset expands The Elder Scrolls Online in exciting and innovative ways, offering incredible adventures for both ESO veterans and those new to the game. Key FeaturesA New Elder Scrolls Online Chapter for everyone The Elder Scrolls Online: Summerset builds on ESO’s Chapter structure introduced last year with ESO: Morrowind. Chapters deliver massive amounts of new content and features that are equally accessible and fun for both existing and new ESO players. New Players: New players can jump right into The Elder Scrolls Online: Summerset and start a character in a fresh tutorial and starter area, without needing to play previous ESO content. Since the original base game is included with The Elder Scrolls Online: Summerset, new players also have access to hundreds of hours of additional adventures throughout Tamriel. New players get immediate access to the full base game with any Summerset digital pre-purchase. Existing Players: ESO veterans will be able to upgrade and take their existing hero to Summerset to begin new adventures. No matter their level, existing characters will find level-appropriate content from the moment they step into Summerset. Haven’t played ESO in a while? The Elder Scrolls Online: Summerset is a best chance to jump back into ESO and continue adventures or start anew. Players only need to reinstall the game, log in, and start playing again.Journey to the Mysterious Summerset Summerset is a massive new zone filled with new characters, stories, landmarks, and adventures. Players will traverse a stunning landscape fill with tropical lagoons, forests bursting with vibrant colors, and grand cliffside vistas while visiting massive and gorgeous manicured cities that reflect the sophisticated tastes of the High Elves. An All New Skill Line -- Join the Psijic Order	The secretive Psijic Order, the precursor to the Mages Guild seen in other Elder Scrolls games, makes an appearance in The Elder Scrolls Online: Summerset. For the first time ever, the player will be able to travel to their home island of Artaeum and join the ranks of these mysterious mages to gain access to their mystical powers, unlocking powerful new abilities.More Incredible Elder Scrolls Stories Continuing the epic meta-story that began in 2015 with the Orsinium DLC Game Pack, players will once again face the Daedric conspiracy that threatens to destroy all of Tamriel. At the behest of Queen Ayrenn, who has opened Summerset to foreigners by royal decree, players will embark on a sweeping adventure to rejoin the infamous Khajiit spy Razum-dar, meet the mighty sages of the Crystal Tower, and fight for Tamriel’s fate once more. Amongst the beauty of the ancestral home of the High Elves, shadows rise and rumors spread of strange disappearances. A corrupting influence works to destroy High Elf society from within, and now, whispers stir of Daedric followers organizing in the shadows.Expanded Crafting System – Jewelry Crafting	The Elder Scrolls Online: Summerset introduces one of players’ most requested features, an all-new crafting ability – Jewelry Crafting. Players will be able to forge potent new gear to bolster their power for their new adventures, leveraging their experience and resources to gain every advantage to succeed on their quest.New Group Activities Band together with friends to conquer new challenges, including a new Trial, Delves, Group Events, and more. System Requirements Windows - Minimum OS: Windows 7 64-bit Processor: Intel® Core i3 540 or AMD A6-3620 or higher Memory: 3 GB RAM Graphics: Direct X 11.0 compliant video card with 1GB RAM (NVidia GeForce 460 or AMD Radeon 6850) DirectX: Version 11 Network: Broadband Internet connection Storage: 85 GB available space Sound Card: DirectX compatible sound card Windows - Recommended OS: Windows 7 64-bit Processor: Intel® Core i5 2300 or AMD FX4350 Memory: 8 GB RAM Graphics: Direct X 11.0 compliant video card with 2GB RAM (NVIDIA® GeForce® GTX 750 or AMD Radeon™ HD 7850) or higher DirectX: Version 11 Network: Broadband Internet connection Storage: 85 GB available space Sound Card: DirectX compatible sound card Mac - Minimum OS: OS X 10.9 Processor: Intel Core 2 Duo processor Memory: 4 GB RAM Graphics: NVidia GeForce 460 or AMD Radeon 6850 (1GB of VRAM) Network: Broadband Internet connection Storage: 85 GB available space Mac - Recommended OS: OS X 10.9 or Later Processor: Intel i5 processor Memory: 4 GB RAM Graphics: NVidia GeForce 640 or AMD Radeon 5670 (1GB of VRAM) Network: Broadband Internet connection Storage: 85 GB available space ©2018 ZeniMax Media Inc. 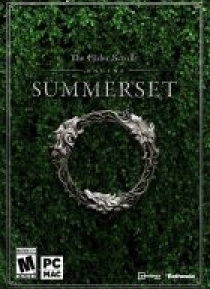 The Elder Scrolls® Online: Summerset™ developed by ZeniMax Online Studios LLC, a ZeniMax Media company. ZeniMax, The Elder Scrolls, Summerset, ESO Plus, Bethesda, Bethesda Softworks and related logos are registered trademarks or trademarks of ZeniMax Media Inc. in the US and/or other countries. All Rights Reserved.